Here’s Rev Andrew Johnson describing some of the ways that he was seeking to form young adults through participation in Christian practices – part of my doctoral research from 2012. Rev Andrew Johnson – Practices of Discipleship from Craig Mitchell on Vimeo. You can order Williams’ book from Book Depository or Amazon (Australia). You can also download the booklet in sections here in PDF format. Eventually (by Easter time) you will be able to download the whole booklet. Welcome to the journey of Being Disciples. To be a disciple is to be a follower of a less-travelled Way, an unfolding Truth and a compelling Life. Discipleship is about learning to follow – not just anyone, but a particular Master, Teacher, Healer, Messiah, Saviour – Jesus Christ. This Study Guide is based around Rowan Williams’ wonderful book Being Disciples (London:SPCK 2016). Williams is the former Archbishop of Canterbury. You will need to order the book (try bookdepository.com). You will also need a book for journal reflections. This Guide includes a plan for daily devotional reading of the book during Lent with Scripture, prayer and journal prompts.It also includes a weekly small group discussion outline. You may commence the daily readings anytime during the week of Ash Wednesday and organise weekly small groups as suits your schedule leading up to Easter. 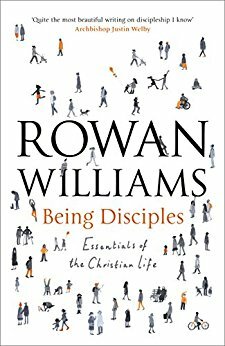 Rowan Williams’ book itself was not written as a Lenten study, however its theme of discipleship is about learning to be and do that to which followers of Jesus are called. The study guide contains a range of Bible readings and does not follow any particular lectionary readings. Each week has an introductory video which you will find at [Vimeo link to be added]. [new Facebeook group to be added]. 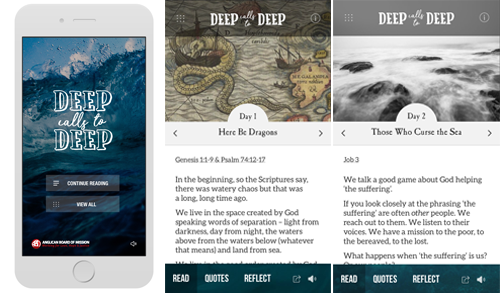 Here are two mobile devices apps for daily devotions, added to my Pinterest page on Mobile Apps for Ministry. Both are produced by the Anglican Board of Mission in Australia. 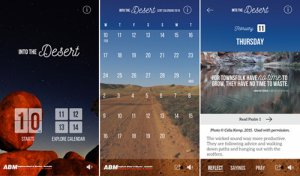 “Into the Desert” is a 40 day spiritual journey designed for Lent. but it can be undertaken any time of year. Available for both Apple iOS and Android devices. “Into the Desert” is also available in print and there is an accompanying optional simple set of small group reflection questions available here. “Deep Calls to Deep” is an post-Easter journey exploring faith. Young adults in the Uniting Church are not leaders for tomorrow but leaders today. We celebrate their gifts, vision, passion and wisdom. NYALC and other events like it bring together young adults from the many cultures that make up the UCA – to encourage them in faith, to hear each other’s voices, to grow together in Christian community. These are powerful, transformative events because the Spirit draws people as one body in Christ. It is a taste of who we are becoming as the people of God. In our 40th year, may we as a church encourage young people as leaders to have a voice, to make decisions, to challenge our structures, to shape our budgets, to dream dreams and see visions, to be prophets and evangelists and pastors and teachers and mission leaders. All of this is us. Our Church. Our Hopes. from Craig Mitchell on Vimeo. The Uniting is running another national ABOUT FACE program – a faith and culture exchange for people 18 years and over visiting indigenous communities in Australia. The event takes place in late June and early July. Applications close 14 May. Details here. ABOUT FACE – Hannah Part 1 from Craig Mitchell on Vimeo. ABOUT FACE – Rohan from Craig Mitchell on Vimeo.